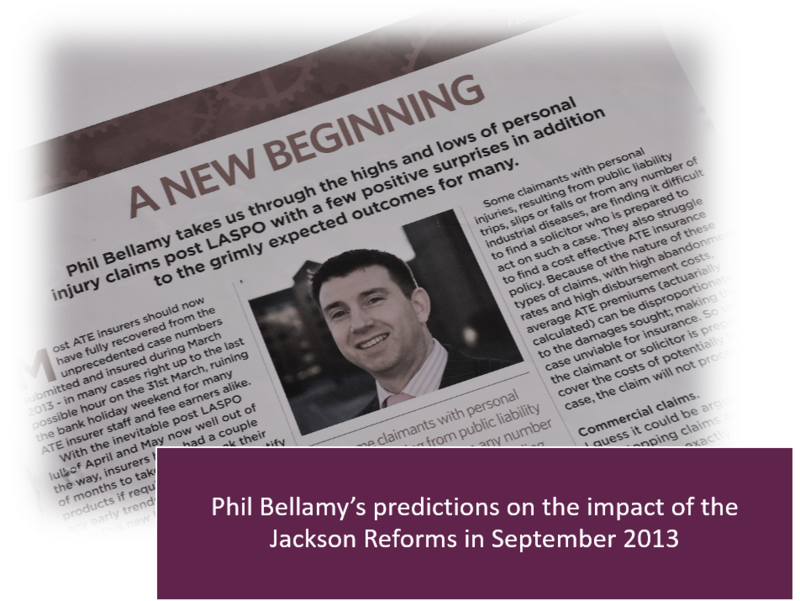 Whilst up in my loft recently repairing some “beast from the East” storm damage, I stumbled upon an old article I had written entitled A New Beginning, which attempted to make some predictions about how a post Jackson reforms world may look. Five years on, and with Lord Justice Jackson now retired, I thought it may be interesting to review the predictions versus reality. Regrettably, the first trend noted post Jackson of personal injury law firms closing is certainly still an ongoing topic. One only has to google “PI law firm closing” to see the terrible damage done to businesses and individuals alike. Law firm consolidation has also continued apace, and whilst good news for those who keep their jobs, it does not guarantee success going forward as a number of mergers have ended in disaster. I didn’t mention ATE insurers closing in the original article, but it’s certainly worth noting that at least four providers have now been put into run off, in the recent past. The initial strong take up of the “standard” PI (RTA and EL) ATE insurance noted has continued, albeit with appropriately lower premiums, some as low as £35 compared to £350 for the same case type pre LASPO. The structure of the overall PI ATE market has changed somewhat, with many cases now being insured via PCC’s (Protected Cell Captives) and not directly with the traditional ATE market. However, the changes due in April 2019 will all but kill the RTA ATE insurance market, and significantly reduce the non-motor pool of risks going forward, so the initial strong take up post Jackson will have run its course by next year, leading to another reduction in work for both law firms and insurers. "It is clear that Clinical Negligence is going to be a more significant part of an ATE insurer’s book going forward' is what I said back in 2013, and there is absolutely no doubt about it, it is. Post LASPO, the average ATE insurer, or ATE MGA’s book of business has been dominated by clinical negligence cases, accounting for circa 80% of written premium. All well and good, except for the fact that the so-called partial ATE premium recovery exemption allowed for this class of claim, has in hindsight, been an unmitigated and total failure. Whatever the rights or wrongs of the exemption proposition were, the fact is, ATE insurers have been, and still are, significantly underwater post Jackson on clinical negligence business. There are a number of reasons for this poor performance that have been previously well documented, and do not need rehearsing again here. Of course, nobody will give two hoots about ATE insurers losing money on clinical negligence business, but historically, insurers were needed both pre and post Jackson to prosecute these cases due to the very high costs involved. This situation may or may not change next year with the proposed new fixed fees being introduced in early 2019, but I imagine some sort of ATE insurance support will still be required in the future, although there has been no mention of it in any FRC proposals so far. Let’s hope they abolish the partial recovery exemption so we all know where we stand with recovering the ATE premium. Finally, I did suggest in my closing paragraph that the reforms had led to a reduction in access to justice for SME’s with small to mid-sized commercial disputes, and that would-be claimants seeking damages of less than £50,000 were likely to be rejected on a financial viability basis, despite having a great case in law. I must confess on this item I was wrong. Post Jackson experience now confirms that even a £50,000 claim is not large enough to make the litigation financials work for such disputes. They really do need to be at the £100,000 level at least for law firms and insurers to even consider taking on a CFA/DBA/ATE basis. This is certainly an area where pre-paid BTE legal expenses insurance would be well worth the investment.